In my conversations with Android developers, I often hear that you’d like better protection against unauthorized use of your applications. So today, I’m pleased to announce the release of a licensing service for applications in Android Market. This simple and free service provides a secure mechanism to manage access to all Android Market paid applications targeting Android 1.5 or higher. 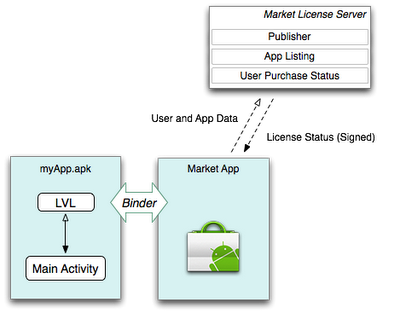 At run time, with the inclusion of a set of libraries provided by us, your application can query the Android Market licensing server to determine the license status of your users. It returns information on whether your users are authorized to use the app based on stored sales records. This licensing service operating real time over the network provides more flexibility in choosing license-enforcement strategies, and a more secure approach in protecting your applications from unauthorized use, than copy protection. The licensing service is available now; our plan is for it to replace the current Android Market copy-protection mechanism over the next few months. I encourage you to check out the Licensing Your Applications section of our Developer Guide and the Android Market Help Center to learn how you can take advantage of this new service immediately.